Does booty sculpting machine praised by Khloé Kardashian work? (NEW YORK) — The Kardashian family is known for their famous curves and there are plenty of fans who want to achieve similar looks. So when Khloé Kardashian shared some “booty” secrets on her former blog — crediting kettlebell weights, a boss balance trainer and The DB Method Machine for her figure — ABC News had to investigate. The DB Method Machine is “a booty sculptor that you can easily fold up and store out of sight??? Yassss, please!” she wrote enthusiastically to her followers. What is The DB Method? The DB Method is a machine that “sets the body in the correct form to do the perfect modified squat,” according to the company’s website. Founder Erika Rayman told ABC News’ Good Morning America that she came up with the idea for The DB Method after working with a trainer to target her glutes. Realizing there wasn’t an at-home machine for it, she said she “decided to invent it” herself. With just 10 minutes a day for 30 days, Rayman said you should be able to see noticeable results. GMA Day producer Dani Kipp tried out the DB Method for 30 days. She said she “definitely noticed a difference” and she plans to keep using the machine. 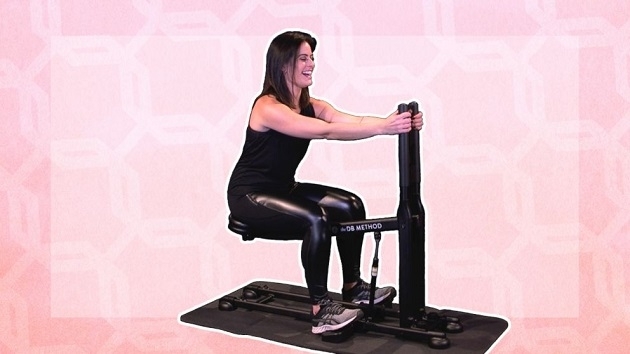 Despite Dani’s results, personal trainer Mark Langowski, CEO of Body by Mark Wellness, told GMA that you can achieve similar results without buying a machine like this, which costs $299. “It is absolutely 100 percent possible to get a great booty without the use of machines like this one,” Langowski told GMA. Langowski said squats, lunges and deadlifts will also build the muscles in your lower body. And if you want to imitate the position that the machine puts your body in, hold onto something that’s fixed into place.